Click on the cloud for the original May 23, 2010 post. Click on the Angel for the whole, really cool, story. You have to go out of your way to find Twist, Arkansas. When you see a sign that says Twist with an arrow pointing right, you follow your whimsy and make the turn. I did that back in May 2010 when I did the original “Twist of Fate” post. This week we are revisiting that post where we saw the great thunderhead to your left, discovered how B.B. King came to name all of his guitars Lucille, saw a building consumed by ivy − and saw a Angel in a bean field. Finding the Angel was the big deal of the day, since one simply does not expect to happen across a giant Angel in a remote bean field in Northeast Arkansas. You’ll have to go to Corndancer dot-com to get the whole story on the Angel in the bean field. It’s worth the trip. The performer is certainly not a misfit. He can whack that guitar with the best of them. 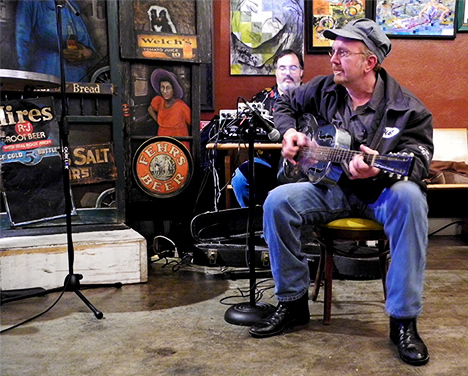 He is entertaining a grateful dinner audience at the Starving Artist Cafe in North Little Rock, Arkansas. I have a growing collection of pictures which have fallen between the cracks to mostly undeserved ignominy. Not because they are necessarily bad pictures, they just did not fit a story at the time they were fresh. I suppose they are functional misfits. Given that commonality, it occurred to me that a parade of misfits would give these previously not-yet-seen-the-light-of-day pictures their 15 minutes of fame. The only thing these pictures have in common other than who pushed the shutter button, is that they have nothing in common. Well, they do have something in common with the pictures on the Photo of the Week page at Corndancer dot com. They are from the same litter. Click to visit Corndancer dot com and see the misfits that got this whole thing started. 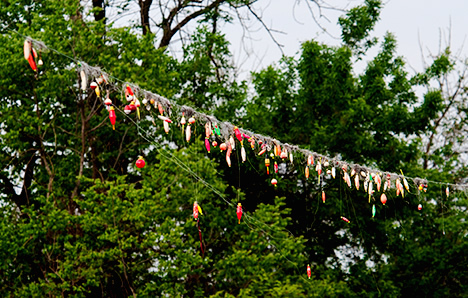 The collection of snarled bobbers, weights, and a few lures continues to grow on a telephone line crossing a narrow part of Noble Lake southeast of Pine Bluff, Arkansas. Folks fish from the bridge and as they sling temptations to the fish, they sometimes run afoul of the wire. We’ve shown this location before, but not this particular picture. 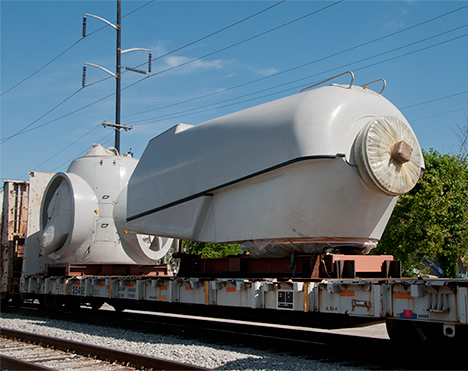 You are looking at the hub and gear housing for a wind turbine snaking its way across Pine Bluff, Arkansas via the Union Pacific Railroad. The housing is bigger than a large RV. We’re talking humongous here folks. 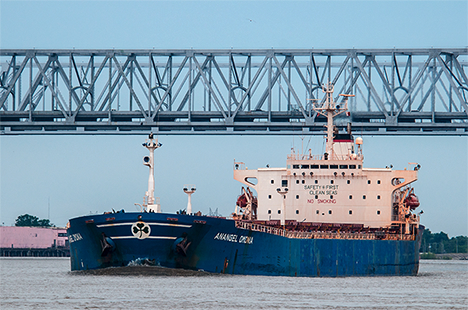 Further south in Louisiana, a huge ocean-going vessel has just gone under the “Crescent Connection,” bridge across Mississippi River. Back in the day when my brother lived in Nawlins, they called it “the great chicken bridge.” Why, I do not know. 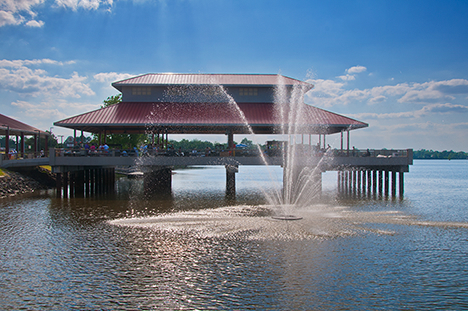 Early afternoon sunlight turns the spray from the Louis L. Ramsay Fountain at Saracen Landing in Pine Bluff, Arkansas into shimmering aquatic jewels. This is normally not a good time to shoot, unless you want a fountain to look like shimmering aquatic jewels. Seemed to be the right thing to do at the time. 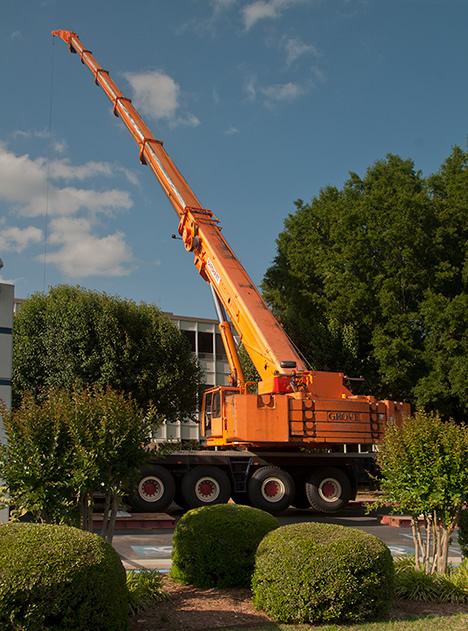 Finally, a big ol’ crane is moving some huge air conditioning outside units which are surrounded by buildings. The crew handling the event was as impressive at the big machine. There were a lot of them and they took their work seriously. Reminded me of a shuttle launching. Well, I guess there’s an exception to every rule. Here’s a band that performed in the same program as the guitar guy in the first picture at the Starving Artist Cafe. They were good entertainers. The beer bottle to the right side of the image seemed to be a good part of the story. This post is respectfully dedicated to all misfits. Including myself. Click on the bridge for the original pictures and story. 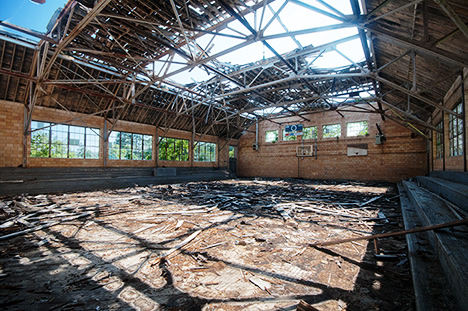 Back in October 2010, I headed south to shoot an old building near Watson, Arkansas. Once I arrived at Watson, my plans were changed. As a result, I eschewed the old building, which was being used as a residence anyway, in favor of Yancopin Bridge. The resulting pictures and story have been one of the most popular and most revisited posts at Weekly Grist. So, we are taking a second look at the bridge and reminding ourselves that a change of plans is not necessarily a bad thing. And in many circumstances, as clearly illustrated by this set, may be better than our original intentions. That says something for keeping an open mind for fortuitous turns: Soldiers call ’em targets of opportunity, salesmen call ’em bird nests on the ground. Yours truly calls it blind hog finds acorn (actually should be: “bline hawg fines akern.”) Click here and see the original post. PS: For those of you who are interested, there are a couple of new pictures on our Photo Manipulation page. Thirsty rice requires a lot of water. Here in LA, most of the water for rice comes from wells. Those wells are pumping like crazy now, just like they were in June 2009 when I first shot this picture. Click on the picture to see the original “Water Woes” article and pictures. Here in LA (lower Arkansas), in the early months of the summer of 2009, many of us were convinced that the heat and drying conditions were experiencing were world class, off-the-chart, bad. Little did we know what was lying in store for us three years later in the summer of 2012, so this week we are sending you back to our June 28, 2009 post to compare notes. You may also want to peruse the original Corndancer Photo of the Week treatise and pictures on the same subject. Our current conditions of day after day of 100 degree plus temperatures, sparse, if any rain, and blistering sun make those days in 2009 seem like a minor inconvenience. The truth be known, many of us observe these untoward phenomena from air conditioned comfort with our fingers crossed that the faithful old a/c, however burdened, will hold on. Despite our griping, our exposure to the elements usually consists of a sweaty traipse through a torrid parking lot to a vehicle, the interior of which could be temporarily leased to a local bakery. We open the door, mutter naughty mutterings regarding the oven-like conditions and shortly thereafter whisper a small thank you to the Almighty for letting the air conditioner blow a north wind in our grateful faces. Things could be worse. Oh, and by the way, just in case you did not notice the new page on this site in the main menu above, see our new page on Photo Manipulation.